My sister Allison Krause was one of four students killed in the 1970 Kent State shootings. You may have heard about that day in American history – May 4, 1970 – when the Ohio National Guard opened fire on unarmed students protesting the invasion of Cambodia. Some of those killed or injured were just walking to class. After the guardsmen fired their weapons, four students lay dead, and nine others were wounded by gunfire. Forty years have passed and no one has ever been held accountable. When courts fail to bring justice to the injured and when governments prefer to neglect their role in such tragedies, families sometimes turn to alternative means of gathering the truth. So after years of exhausting efforts to find out what happened on the day of Allison’s death, and failure to receive any meaningful recognition for the injury suffered by our family, we decided to establish the Kent State Truth Tribunal on the 40th anniversary of the killings. We felt the imperative to do this for our family and also to come together with others to create an accurate historical account of what happened at Kent. The Kent State Truth Tribunal (KSTT) teamed up with a remarkable filmmaker named Emily Kunstler, who has dedicated her work to the pursuit of criminal justice in this country. Her father Bill Kunstler was a larger-than-life civil rights attorney who had stood with the Kent State students in the difficult years that followed the shootings. Emily is carrying on his work by harnessing the power of storytelling to establish and memorialize the truth about Kent State. The KSTT was held on the first four days of May in Kent, Ohio and we recorded and preserved over 70 personal stories of original participants and witnesses. A number of the wounded students shared their truth of what happened that horrific day in American history, along with faculty, student witnesses, Kent townspeople and friends and family of those killed. Some spoke publicly for the first time in four decades. The stories that emerged are powerful narratives about a day that changed America and helped us understand what happened on that historic day. As we filmed the interviews, they were broadcast live on MichaelMoore.com and were viewed throughout the country. This is the first time that a truth-telling initiative in America set out to use new media in this way and it was remarkable to broadcast these accounts live throughout the country. Little did we know that as we wrapped our project in Kent, the Cleveland Plain Dealer and ace reporter John Mangels would break a key piece of news long sought after by those eager to learn the truth about Kent State. The journalist uncovered evidence of an ‘order to shoot’ given to the National Guardsmen on Blanket Hill that May 4th so long ago. Over the ten years that the families pursued justice in Ohio state and federal courts, the testimonies from the Ohio National Guard and ranking decision-makers supported the ludicrous claim that no order to fire was given. An order would have implicated higher-ranking officers and would have led to court-martials for those involved. Since an admission of command responsibility for the shootings was not forthcoming, it became our job to prove them wrong. This was almost impossible…until now. The Plain Dealer investigation produced a copy of an audio tape recorded by a student using a microphone on his dormitory room window ledge. This tape surfaced when Alan Canfora, a student protester wounded at Kent State, and researcher Bob Johnson dug through Yale Library’s collection on 1970 Kent State to find a CD with the tape recording on it from the day of the shootings. Paying $10 to have a duplicate made, Alan listened to it and immediately knew he probably held the only recording that might provide proof of an order to shoot. Three years after the tape was found, the Plain Dealer commendably hired two qualified forensic audio scientists to examine the tape. They verified an order for the guards to ‘prepare to fire’. Shortly after the tape was publicized a remarkable event unfolded in another part of the world with direct parallels to Kent State. British Prime Minister David Cameron formally apologized before Parliament for the events and killings of Bloody Sunday. As you may recall this event occurred on January 30, 1972, when British paratroopers opened fire on demonstrators in Northern Ireland and 14 civilians were shot and killed and others wounded. The bloodshed led to a major escalation of the “Troubles” in Northern Ireland, which have only recently largely subsided. Like Kent State, the military shot and killed its own unarmed citizens. What happened should never, ever have happened. The families of those who died should not have had to live with the pain and hurt of that day, and with a lifetime of loss. Some members of our armed forces acted wrongly, the government is ultimately responsible for the conduct of the armed forces, and for that, on behalf of the government, indeed, on behalf of our country, I am deeply sorry. While news of the Bloody Sunday apology begins to spread and settle, original participants are beginning to call for even greater steps to condemn the higher-ranking officers that made this deadly decision to shoot and kill. As I watch from my perch in America, I ponder the complexities of apologies and our need for truth in the Kent State killings of 1970. From conversations with others who were present at and witnessed the shootings at Kent State, I know that we all wish to have the truth revealed in 2010 and applaud Britain’s important first step to address the harm caused by Bloody Sunday. And I have to ask: what will it take for America to heal the wounds of Kent State? Editor’s Note: Since January 1, 2010, we have been working on the Kent State Truth Tribunal, please go to www.TruthTribunal.org to learn more about our efforts to reveal the truth at Kent State in 2010. Thanks! My name is Laurie Krause. I am the sister of Allison Krause, the daughter of Arthur and Doris Krause. I want to thank you for gathering together today. It’s an honor to be here at Kent State University to participate. I’d also like to thank the student body and May 4th Task Force for inviting me. I am here to honor people who follow their truths, to respect people who live their ideals, and to focus on the healing of Kent State and our community at large. 39 years ago today, my sister, Allison Krause, was murdered by the Ohio National Guard for protesting and demonstrating against the Vietnam War. Also killed were Jeffrey, Sandra and William, and nine other Kent State students were seriously injured. I’m pleased to see a number of the surviving protesters here today, thank you for being here. Allison was a freshman at Kent State who was incredibly passionate about life. She was a peace-loving, confident, altruistic, honor-student wanting to get the most out of college, and she was also deeply in love with her boyfriend, Barry. As my older sister, Allison was someone I looked up to. She was so creative. I still look up to her and continue to be inspired that the whole world may be changed by any real person, like you or me, walking forward with hope and living our ideals and truths. Let me ask you, today, are you living your truth? Allison vehemently disagreed with the US government and its involvement in Vietnam so she assembled with many others and protested on Friday, the first of May, not knowing that she was putting her life in jeopardy, yet feeling strongly that the actions committed by our government were wrong. On that day, a group of 500 students assembled to protest the US invasion of Cambodia. Rallies were planned for Monday to continue protesting the expansion of the Vietnam War. The Ohio National Guard was sent in on Saturday and Kent State became a war zone overnight. Students were tear gassed and wounded by bayonets during demonstrations taking place over the weekend. The ROTC building was burned down in retaliation for the students being attacked for expressing their right to protest and assemble. Press conferences held by Gov. Rhodes called protesters un-American. Rhodes declared a state of emergency, banned any further demonstrations and imposed martial law at Kent. Curfews were set. Students had to run from Guardsmen on campus late at night and Allison ran from them that night. Students couldn’t return to their dorm rooms and were stuck wherever they could find shelter for the night. Over the following days, the Kent State University campus ignited into one of our country’s worst nightmares. As tensions heightened over the weekend, Allison called home to my parents to let them know what was happening on campus. My father told Allison to be cautious; he even asked her to back down and not involve herself. My parents, like most parents, were coming from a place of love for their daughter. They wanted her to be safe. But Allison was aware of the risks involved. Still, she never considered not protesting against something she was incredibly passionate about. The Vietnam War had just taken a turn for the worse, it was a time when hope for peace was fading. To Allison, it was an obligation to show dissension to the government invading Cambodia. She made her decision, and we all know the outcome. That Monday, despite school officials attempting to ban the demonstration by sending out leaflets, more than 2,000 people arrived to protest the government’s actions. The dispel process began that morning with leaders telling student protestors to go home or be arrested. Students responded to these infringements of rights by throwing rocks. Wearing gas masks, the National Guard used tear gas to exert control over the growing crowds. After some time with a lot of maneuvering Guardsmen turned in unison and took aim. The shooting lasted 13 seconds. Dumdum bullets were used – a type of bullet that’s illegal in warfare – and explodes on impact. My sister died in Barry’s arms. 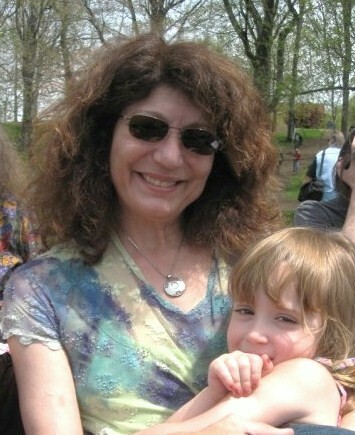 Allison’s death symbolizes the importance of our right to protest and speak our truths freely. The day after the shooting, my father Arthur Krause spoke on television, telling the public how Allison’s death shall not be in vain. Afterwards, my parents followed their truth through the legal system and in the courts over the next nine years. They sought the truth about Kent State and the reason for the murder of their daughter … going all the way to the US Supreme Court. Their final appeal was settled and the federal government issued a statement of regret. It’s no secret that my family holds Nixon, Rhodes and the State of Ohio responsible. Also, with the recently re-discovered audio tape, proof of an order to shoot has been found. We now know that our government intentionally committed this deadly act against the youth of 1970, calling them ‘bums’ as they protested the Cambodian Invasion. Triggers were not pulled accidentally at Kent State. What happened was malicious, what happened was irresponsible, what happened was evil. The shooting was at best, without any forethought, and at worst, with total forethought. Firing on a group of unarmed students, who were simply exercising their First Amendment rights to express dissent with their government was a crime. What do we do with an order to shoot? What can you do when the government gives permission to use ultimate force, to use deadly force, against its dissenters? It was the government’s goal to make a defining statement and shut down student protest across the country that day…and they did…for years! There is no such thing as a true democracy when this happens. The local, state and federal governments never accepted responsibility for the murder of Allison, Jeffrey, Sandra and William and the injuries sustained by nine others that occurred 39 years ago today. The people injured in the protests are reminded of it everyday. The Kent State shooting has changed all of our lives forever, both on the inside and the outside. My family lost its eldest child and were robbed from seeing her blossom in her life past 19 years. I lost my only sister and I miss her each day. Looking back, did the Kent State protest and killings make a difference? Well, there was a huge response by Americans. The Kent State shooting single-handedly created the only nationwide student strike with over 8 million students from high schools to universities speaking out and holding rallies afterward. And Jackson State also culminated in murderous acts in a similar quest to silence student protest. We became a nation at war with itself. But how did we let it get that far? How did this happen? People will never forget that day at Kent State. Today marks an event that still hits deep for so many of us. People who were directly involved, people who believe in the Bill of Rights and the freedom to disagree with the government, people who continue to share a vision of harmony and peace for all. We’re all active participants; we are all involved in what happened. Today is about remembrance, honor, respect and a focal point for a change in the way we handle dissension with governmental actions. What have we learned? What can we take away from this horrible event? For starters, we must each take responsibility for what happened so we may learn from the past, to learn from our mistakes. The order to shoot has always been a concern. In fact, each and every governmental or military official throughout the legal battle has stated under oath that there was never an order to shoot. Now with this re-discovered tape recording, we finally have proof that an order to shoot was given. With this tape, it is very much my belief that until the truth is brought to light here, the Kent State Killings will continue to remain an ugly, unknown, unaccounted-for wound. People were shot for no reason, arrested for not disbanding, and fires started in the streets. At an event with no political subtext, we can see how much kindling there already is, waiting for a spark to ignite an explosion of extreme violence. It’s still there! We’re still seeing the same tension of the Kent State shooting that happened 39 years ago, today. The cause and effect is still active here at Kent State. Unless we heal these wounds, they shall continue festering. Instead of focusing on our differences, let’s focus on what brings us together. Right now, at this point in time, it is critically important that we work together in harmony to benefit all. We can’t perpetuate this us/them polarization of constant reaction to what’s happening around us anymore. I mean, how’s that working for us? Is that working? So, how do you heal a community, a nation? Or should I ask, how do we heal ourselves? Each day as we live our truths, our intentions capture a healing, beautiful, peaceful essence for positive change. Despite harsh criticism by local residents, even by her own president, Allison and others continued on. Allison believed in making a difference. Being anti-war and pro-peace and harmony, she was called to action. Although it was not her clear intention, Allison spoke, participated in and died for what she believed in. Don’t hope for a new tomorrow, live it today and live your truth each day. We all make a difference by speaking our truths against all odds. Through-out my life I looked to my big sister for inspiration. Allison taught me the importance of living a life of intention and truth and I am now consciously and busily speaking my truths. That is Allison’s message and it not just for me. I want to close the speech by sharing with you how I have the spirit of Allison in my life as I live on the Northern California coast. A few years ago under the Bush Administration, a major utility company and the federal government wanted to begin exploring wave energy renewable energy technologies in the Pacific Ocean near where I live. In March 2008, I marched for the Mendocino Wave Energy Moratorium, to be a voice for protecting the marine environment, to slow it down for proper environmental research to be conducted and to involve the community in this project. In 2007 I also began publishing a blog called MendoCoastCurrent. I did this as my personal, political act and operate as the Wave Energy Blogger and an environmental activist now. Allison showed me that it is my responsibility to live and speak my truth. If I do not agree with what’s happening, it is my right to protest, assemble and voice my concerns. Since then I’ve encountered quite a few unforeseen obstacles and hostile harassment, yet I still believe that even in the face of opposing forces and arrest, I must fight my good fight…and keep on, keeping on! Allison whispers this in my ear. Let’s stand up for what is right and best for all. We must protest against injustices and use our voices to speak out when we disagree with what’s happening. On the Mendocino coast as all looked lost regarding the negative effects of wave energy with mounting environmental concerns regarding this nascent technology in our ocean, President Obama was inaugurated. Obama and his administration bring us so much good news. They are approaching renewable energy technology from an environmentally-safe perspective along with incorporating community aims and input now. And that massive utility company is following suit. Environmental concerns in creating safe renewable energy in my community may now be possible! And I feel Allison smiling! We must still remain ever vigilant yet I’ve found a great deal of hope and comfort in what I’ve seen these past one hundred days of Obama. I’m hopeful that we may become more conscious of our use of our precious resources, in using and generating our electricity and in fueling our vehicles. I’m hopeful that the truth about Kent State will someday be known. As we learn to speak our truth, even in the face of danger and opposition, we bring change and harmony. So I ask you…and I ask you for Allison as well…how are you speaking your truth today? 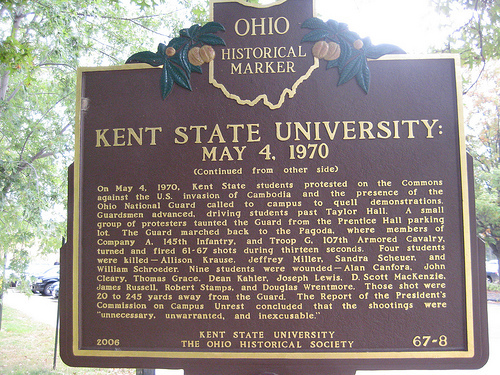 It happened a long time ago in a state on the other side of the country, but the day Ohio National Guardsmen killed four students at Kent State University during an anti-war protest is still a fresh hurt for Laurel Krause. Her sister, 19-year-old freshman Allison Krause, was one of those killed in what became a tragic touchstone for protests against the Vietnam War. Now, 40 years after the May 4, 1970, shootings that also left nine wounded, Krause has launched a personal project to collect a video history of the event. The 55-year-old Mendocino County woman will be coming to San Francisco on Aug. 7 and 8 to set up a camera and record the testimonials of anyone who was at the shootings or was directly affected by them. Witnesses, people who were wounded, relatives of victims, teachers, administrators, National Guardsmen – they’re all welcome, she said. The event will be webcast live from 9 a.m. to 5 p.m. each day on MichaelMoore.com. 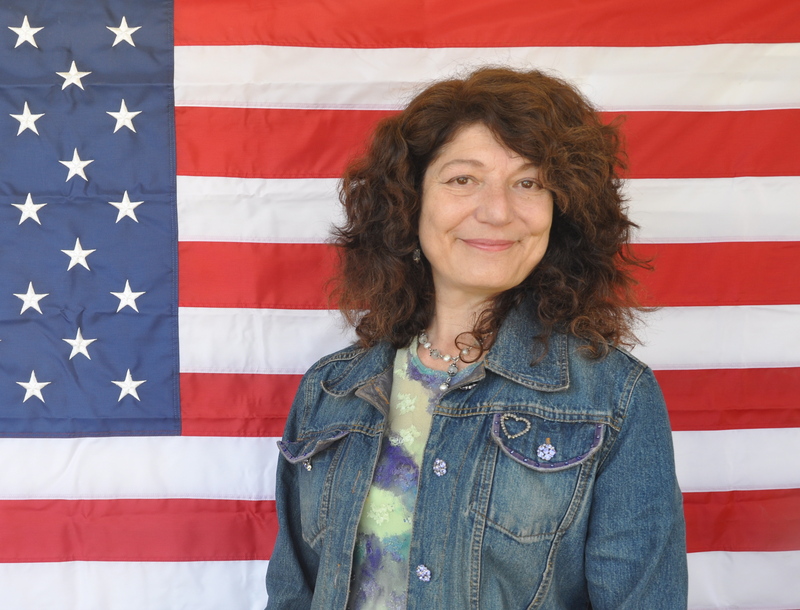 Krause, an environment blogger, is calling her project “The Kent State Truth Tribunal.” Her first collection of oral histories – about 70 in all – was recorded in early May at Kent State, when the university was commemorating the 40th anniversary of the killings. After San Francisco she intends to record more recollections in New York City on October 9 and 10. Co-directing the project with Krause is filmmaker Emily Kunstler, daughter of the late civil rights lawyer William Kunstler. In 1990, then-Ohio Gov. Richard Celeste apologized publicly for the shootings, but nobody was ever officially held accountable for the killings. Varying accounts have been offered over the years of whether the National Guardsmen were ordered to open fire on the anti-war protesters or did so spontaneously. Krause is convinced the shooting was deliberate. She wants an apology from the federal government, because the U.S. invasion of Cambodia during the Vietnam War was what precipitated the protests that led to the shootings. Krause intends to give her collection to a library at New York University. Earlier this year, the shooting site at Kent State was added to the National Register of Historic Places, and the university started a walking tour of it. The school’s library already has more than two floors worth of archives, including 100 oral histories, devoted to the shootings – but its archivists pick no sides in the historical debate, said Cara Gilgenbach, head of special collections and archives. “There are many varying narratives of what occurred,” she said. To find out more about the tribunal event in San Francisco, and to register to give a testimonial, go to truthtribunal.org. Watch this remarkable 1970 Kent State shootings home movie sync’d with a copy of an audio recording enhanced by the Cleveland Plain Dealer in May 2010. The Plain Dealer claims this enhanced version contains the Ohio National Guard’s order to ‘prepare to fire’ at the group of unarmed students. . . do you hear it? 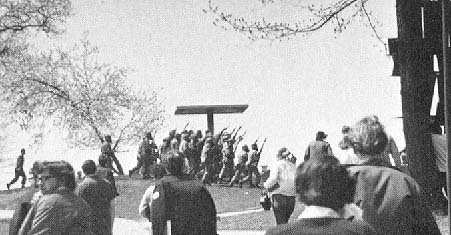 Dozens of investigators, from the FBI to the Presidential Commission on Campus Unrest, reviewed the 1970 Kent State University shootings, but none could resolve the central mystery: Why did Ohio National Guardsmen pivot and pull the trigger in lockstep when they fired from the university’s Blanket Hill? Over the years, there was no concrete evidence that the Guard had orders to fire. Now there is, thanks to a sophisticated analysis of an amateur recording, according to a remarkable story by Plain Dealer Reporter John Mangels this week. Gov. Ted Strickland should follow up on these intriguing findings and create a commission to study the tape, incident reports and eyewitness testimony and give a full accounting of that tragic day — not for the courts, but for the sake of the historical record. Likewise, the U.S. and Ohio attorneys general should consider whether the new audio evidence is sufficient to reopen their inquiries and follow up with attempts to verify the tape’s analysis. A contentious court case over the shootings, which killed four people and wounded nine, was settled in 1979. Ohio paid $675,000 to victims and survivors. There is no need to reopen it. And it’s true that some important questions may never be answered. Analysis of the tape, for instance, sheds no light on who might have given the order to fire, or why. However, if what is heard on the recording can be verified as a command, it could shed light in all of the long-hidden corners of this case for the victims left behind and those still absorbing its lessons. Already much has been learned from the shootings at Kent State. Law enforcement now uses less lethal methods to control even unruly protesters. Still, deadly clashes between police and civilians continue to occur in tense, hostile times that are reminiscent of Kent State during the Vietnam War. New Orleans is reeling from recent, stunning admissions from four police officers who pleaded guilty to covering up a police shooting of innocent, unarmed civilians on the Danziger Bridge after the devastating Hurricane Katrina. Police now say they raced to the bridge because of reports of gunfire nearby, but when they arrived, all they saw were unarmed civilians. A U.S. District judge was right to call the revelations sickening. It took five years for the truth to come out about Danziger Bridge, for the record to begin to be set straight and for some cops to face justice. Uncovering the truth about the shootings at Kent State University has taken far longer, but with a new revelation in hand, Gov. Strickland shouldn’t give up on it now. History is worth getting right. Watch and learn the truth about 1970 Kent State shootings from the original witnesses and participants recorded at the 40th anniversary in Kent, Ohio. “Get down!” someone shouts urgently, presumably in the crowd. Finally, “Guard! . . . ” followed two seconds later by a long, booming volley of gunshots. The entire spoken sequence lasts 17 seconds. The previously undetected command could begin to explain the central mystery of the Kent State tragedy – why 28 Guardsmen pivoted in unison atop Blanket Hill, raised their rifles and pistols and fired 67 times, killing four students and wounding nine others in an act that galvanized sentiment against the Vietnam War. The order indicates that the gunshots were not spontaneous, or in response to sniper fire, as some have suggested over the years. The review was done by Stuart Allen and Tom Owen, two nationally respected forensic audio experts with decades of experience working with government and law enforcement agencies and private clients to decipher recorded information. Allen is president and chief engineer of the Legal Services Group in Plainfield, N.J. Owen is president and CEO of Owl Investigations in Colonia, N.J. They donated their services because of the potential historical significance of the project. Although they occasionally testify on opposing sides in court cases hinging on audio evidence, Owen and Allen concur on the command’s wording. Both men said they are confident their interpretation is correct, and would testify to its accuracy under oath, if asked. The original 30-minute reel-to-reel tape was made by Terry Strubbe, a Kent State communications student in 1970 who turned on his recorder and put its microphone in his dorm window overlooking the campus Commons, hoping to document the protest unfolding below. It is the only known recording to capture the events leading up to the shootings – including a tinny bullhorn announcement that students must leave “for your own safety,” the pop of tear gas canisters and the wracking coughs of people in their path, the raucous protest chants, the drone of helicopters overhead, and the near-constant chiming of the campus victory bell to rally the demonstrators. Strubbe has kept the original tape in a bank vault, and recently has been working with a colleague to have it analyzed, and to produce a documentary about what the examination reveals. The Justice Department paid a Massachusetts acoustics firm, Bolt Beranek and Newman Inc., to scrutinize the recording in 1974 in support of the government’s ultimately unsuccessful attempt to prosecute eight Guardsmen for the shootings. That review, led by the company’s chief scientist, James Barger, focused on the gunshot pattern and made no mention of a command readying the soldiers to fire. Someone made a copy of the Strubbe tape in the mid-1970s for use in the civil lawsuits that the shooting victims and their families filed against the Guardsmen and Ohio Gov. James Rhodes, who had sent the reserves to restore order at Kent State. One of the plaintiffs’ lawyers donated the cassette copy of the Strubbe tape to Yale University’s Kent State archives. Canfora, one of the wounded students, found it while doing research for a book. The Plain Dealer commissioned an analysis of a digitized version of the Yale tape. Using sophisticated software initially developed for the KGB, the Soviet Union’s national security agency, Allen weeded out extraneous noises – wind blowing across the microphone, and a low rumble from the tape recorder’s motor and drive belt — that obscured voices on the recording. He isolated individual words, first identifying them by their distinctive, spidery “waveform” traces on a computer screen, then boosting certain characteristics of the sound or slowing the playback to make out what was said. Owen independently corroborated Allen’s work. For hours on Thursday, first in Allen’s dim, equipment-packed lab in Plainfield and later in Owen’s more spacious, equally high-tech shop in nearby Colonia, the two men pored over the crucial recording segment just before the gunfire. They looped each word, playing it over and over, tweaking various controls and listening intently until they agreed on its meaning. “That’s clear as a bell,” Owen said at one point as he and Allen replayed the phrase “Prepare to fire” on two large wall-mounted loudspeakers. The two audio engineers didn’t add anything to the recording or fundamentally alter its contents. Instead, they boosted what was present to make it easier to hear. “It’s like putting on eyeglasses,” Owen said. In addition to the prepare-to-fire command, the segment just before the gunfire contains several curiosities. • There is a sound fragment milliseconds before the gunfire starts. Allen believes it could be the beginning of the word “Fire!” – just the initial “f” before the sound is overrun by the fusillade. Owen said he can’t tell what the sound is. • The frequency of the voice giving the command changes as the seconds pass. “I’m hearing a Doppler effect,” Allen said, referring to the familiar pitch change that occurs as a siren passes. “It’s as if he was facing one way and turned another,” Owen said. That’s consistent with eyewitness accounts that the Guardsmen spun around from the direction they had been marching just before they fired. • The 1974 Bolt Beranek and Newman analysis concluded that the first three gunshots came from M1s, the World War II-vintage rifles carried by most of the Ohio Guardsmen. The M1 is a high-velocity weapon with a high-pitched gunshot sound. But Allen and Owen said the initial three gunshots sound lower-pitched than the rest of the volley. “It suggests a lot of things, but we’re not certified ballistics examiners,” Owen said. Pistols typically are lower-velocity, lower-pitched weapons. Several Guard officers carried .45 caliber pistols, but the Bolt Beranek and Newman analysis identified .45-caliber fire later in the gunshot sequence, not among the first three shots. As author William Gordon reported in his exhaustive 1995 book on the Kent State shootings, “Four Dead in Ohio,” several witnesses told the FBI they saw a Guardsman with a pistol fire first, or appear to give a hand signal to initiate the firing. Gordon believes the firing command probably was non-verbal. A few students and Guardsmen claimed at the time that they heard something that sounded like an order to fire, but most of the soldiers who acknowledged using their weapons later testified that they acted spontaneously. “This is a real game-changer,” Gordon said Saturday of the new analysis. “If the results can be verified, it means the Guardsmen perjured themselves extensively at the trials.”. Without a known voice sample for comparison, the new analysis cannot answer the question of who issued the prepare-to-fire command. Nor can it reveal why the order was given. Guardsmen reported being pelted by rocks as they headed up Blanket Hill and some said they feared for their safety, but the closest person in the crowd was 60 feet away and there is nothing on the tape to indicate what prompted the soldiers to reverse course, and for the ready-to-shoot command to go out. Most of the senior Ohio National Guard officers directly in charge of the troops who fired on May 4, 1970 have since died. Ronald Snyder, a former Guard captain who led a unit that was at the Kent State protest but was not involved in the shootings, said Friday that the prepare-to-fire phrasing on the tape does not seem consistent with how military orders are given. Whether the prepare-to-fire order could lead to new legal action or a re-opened investigation of the Kent State shootings is unclear. A federal judge dismissed the charges against the eight indicted Guardsmen in 1974, saying the government had failed to prove its case. The surviving victims and families of the dead settled their civil lawsuit for $675,000 in 1979, agreeing to drop all future claims against the Guardsmen. The federal acquittal means the soldiers could not be prosecuted again at the federal level, although a county or state official potentially could seek criminal charges, said Sanford Rosen, one of plaintiffs’ attorneys in the civil lawsuit. The legal issues would be complex, he said. The presence of a command could give rank-and-file Guardsmen a defense, since they could argue they were following an order. In Pittsburgh, Doris Krause has been waiting 40 years to find out who killed her daughter Allison, and why. Now 84 and widowed, she said Friday the presence of the prepare-to-fire order doesn’t surprise her. She is frustrated, though, that the recording can’t identify the person who gave the order. “I wish there was better proof,” Krause said. “We have to find a man with enough courage to admit what happened.